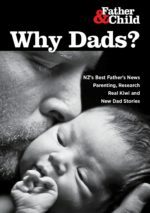 The Plunket Society is trialing a new parenting course for fathers called ‘Dads4Dads’, with an eye to rolling it out nationwide through Plunket. Project leader Claire Rumble says that in principle she prefers courses where both parents can participate jointly, but some of their solo fathers have indicated that having a specific course for dads would be more useful. Initial facilitators for the course trial include stay-home dad Scott Lancaster, who manages the DIYFather web site www.diyfather.com.